30 January mark the day when the Duchy of Libertia joined the Kingdom of Ruthenia, back in 2015. This union of forces were pivotal to make Ruthenia establish itself as a promissing micronational project that eventually would also merge with Karnia to become the Empire of Karnia-Ruthenia, the micronational entity we known today and have spread its influence all over the world. But during the celebrations of the “Libertian Day” of 2019, another union, less equal, was realized. The Kingdom of Cardonia is a constitutional monarchy located in Asia. 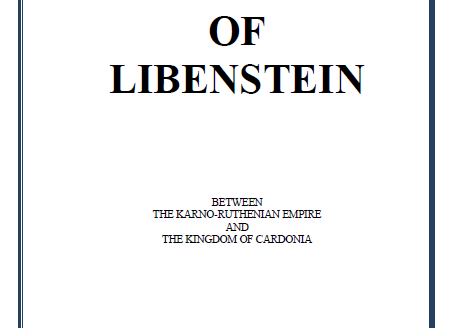 Founded by Carl of Cardonia, better known as Carl, Count Rostrand in Karnia-Ruthenia, on 05 February 2015. It is located withing the boundaries of Ishigakiyama Castle Park. After being dethroned in 2016, Carl recovered the throne and was eager to request his merge to the Empire. But the terms of the treaty were very restrictive. 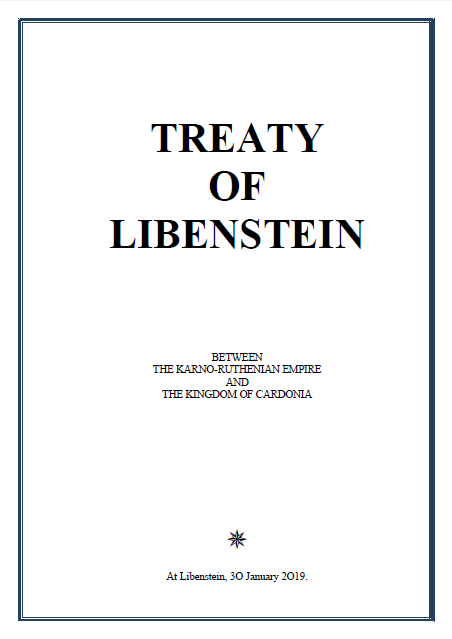 The Treaty of Libenstein, also known as the Karnia-Ruthenia–Cardonia Annexation Treaty, was made by the rulers of the Empire of Karnia-Ruthenia and the Kingdom of Cardonia on 30 January 2019. In this treaty, Karnia-Ruthenia formally annexed Cardonia following the turnover of internal and external affairs to Karnia-Ruthenia. Karno-Ruthenians commentators predicted that Cardonians would easily assimilate into the Empire, especially due the provision that the Karno-Ruthenian Concession in Hakodate would become part of the Cardonian territory. As Oscar I ceded Hakodate to become territory of Cardonia, that in turn was annexed by the Empire, he received as compensation for this “loss of territory”, was ceded to him the former Cardonian royal titles of “Grand Duke of Leuvenberg and of Strena”, and the newly-created title of “Protector of Cardonia”. The Empire grew and reorganized itself in Asia. It remains to observe the gains for the Empire. Will this treaty of hard terms be advantageous?